All pests need food, shelter, and water, are you providing it for spiders? A major resource pests, like spiders, look for is moisture. In your home, excess moisture and water sources can come from a lot of places. Oftentimes, you’ll find spiders hanging out in your bathrooms. Bathrooms typically have a lot of moisture with sinks, tubs, showers, and toilets. There is a lot of opportunity for excess moisture to naturally occur without even considering the possibility of leaks. Fixing leaky faucets, pipes, and plumbing, should be a major focus when removing excess moisture around your home. Having adequate bathroom ventilation and installing exhaust fans to remove excess moisture in your home should be a priority as well. When establishing or verifying ventilation, ensure that the moisture is effectively being channeled out of the home and not just up into an attic. Just a few drops of excess water might not seem like a big deal to you, but that can sustain many spiders especially if they have unlimited access to it. Excess moisture can also come about through cracks and crevices around your home. Heavy rainfalls and summer thunderstorms can increase humidity levels in your home as well as moisture levels. Having dehumidifiers around your home and in places like basements where excess moisture tends to gather can also help to reduce pest problems like spiders. If other pests are attracted to your home, it will also attract spiders as they will have ample food sources. Similar to excess moisture levels around your home, having a lot of exterior lights can attract a lot of extra insects and pests to your home. Most insects are attracted to light sources in the dark hours of the day. Well, if you are bringing hundreds of extra insects toward your home, spiders are very likely to follow. Setting up a free, all-you-can-eat buffet for spiders is a sure way to end up getting a few staying in your home. Spiders often make their webs around high traffic areas for insects. So don’t be surprised if you start seeing lots of spider webs around the exterior lights of your home. Putting lots of exterior lights near your home just makes spider’s food catching job much easier. 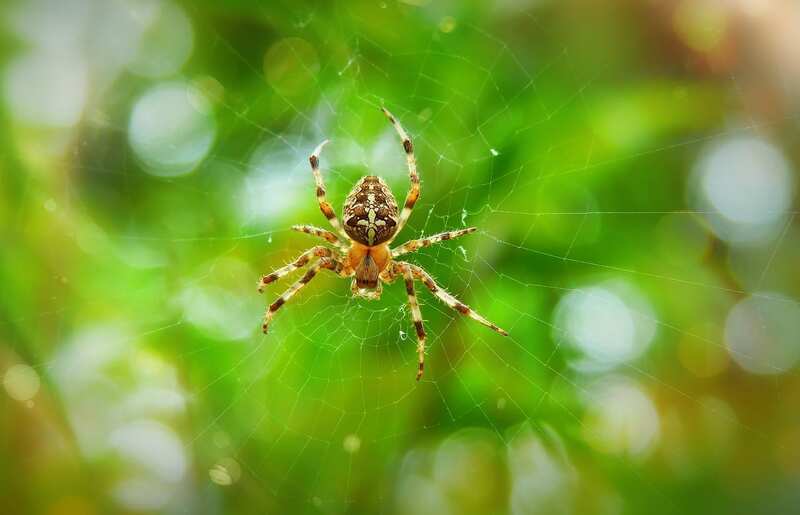 Large exterior windows can attract pests like spiders for a few reasons. The first reason is excess light that can leave your home after the sun goes down. Similar to having excess exterior lights, large exterior windows can cause the same sort of problem by attracting pests with the light escaping your home. Spiders will build their webs close to these high traffic areas for insects and pests to get access to food sources. Unfortunately, through windows is one of the major access points pests get into your home as well. Properly sealing windows, broken screens, and gaps under windows can be a way to help reduce the number of pests, like spiders, getting into your home. Larger windows attract more pests and spiders, so with higher numbers of insects, the chances of spiders getting into your home goes up. In addition to large exterior windows being a light source that attracts pests, it can also be a prime source for heat loss from your home. As temperatures drop and you start to turn the heat on in your home, pests will need to find warmer spots to stay in order to survive. The excess heat escaping from your large exterior windows can keep pests alive later in the season than they normally could survive. Another reason why you’ll get more pest activity around these windows, which also attracts more spiders.